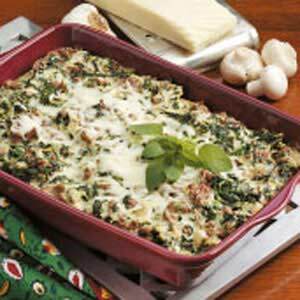 This restaurant recipe for Spinach Casserole is flavorful, quick and easy. According to the restaurant customers, and I agree, this is one of the best spinach dishes you could ask for. It is a great choice for buffet service or for a potluck. And for those people who are counting carbohydrates, you will be pleased to know that this recipe only has about 8 carbs per serving, assuming a total of 10 servings. If you have 12 portions from this recipe, each serving would be approximately 6.65 carbs. In fact, if you and your family or friends do not eat all of it at one time, you can freeze what's left and when you reheat it at a later time it will still be excellent. That's all there is to it! Enjoy your casserole and the company of those you share it with! 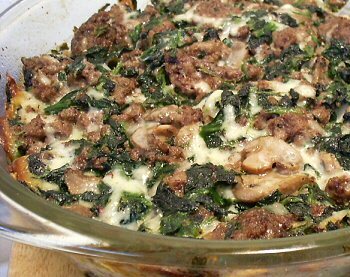 To see more great restaurant casserole recipes, click here.